Thank you for all the feedback and kind comments. This is a great encouragement for our team as well as an opportunity for us to do serve you better next time. The month-long Hajj programme was sufficient for us to conclude that Shahidah Travel & Tours is a people-centric agency, which puts its jemaah's welfare first, providing excellent accommodation, generous buffet spread at meal times and fulfilling spiritual guidance from the ustazs. The same goes to the team of committed officials who provided the overall administrative support. Special mention to Hjh Mustakimah who went beyond the normal call of duty. She seemed to be everywhere, giving 200% of her time while making every effort that our needs are met. A particular incident we wish to highlight was when she, "our little giant", as I nicknamed her, tenaciously pushed the wheelchair my sick husband was sitting on through the thick congregation of Friday prayers outside Masjidil Haram all the way to the medical centre, so that he could get the urgent treatment needed at the centre. We are forever grateful to her. Not forgetting the dedicated ST&T team, namely Hj Abdul Aziz, Hj Norjula and Hjh Haryanti, who were always on hand and showed their sincere concern in my husband's medical condition. 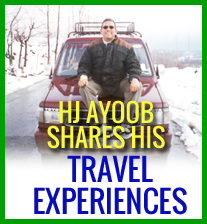 Even Hj Ayoob showed the way by his personal concern and care. Jazakallah khairan kathira. Pengalaman haji sangat memuaskan bagi Siti dan bapa. Ustaz Muslim dan pegawai Shahidah sangat perihatin dan ambil berat akan keadaan jemaah. Terutama yang sakit. Kami megucapkan terima kasih atas segala pertolongan dan tunjuk ajar mereka. Alhamdulillah. The Haj was smooth. The hotels were superb. The delays were unexpected but those are trials and tribulations of pilgrimage we were prepared to face. The Ustaz and agents were very helpful throughout. Appreciate the help rendered. Salam, I would like to give my sincerest and special thanks to Hjh Kamisah, Hj Yahya, Hjh Mustaqimah and Hj Noor Julah (if i've spelt the name correctly) for all their hard work to ensure that the expectations of jemaah Shahidah are met. These are the officers whom i've been served and assisted by personally in some ways which need not be specifically mentioned here. A big THANK YOU to them. Before we departed for the hajj trip, my husband, Nazri, my sil, Norkiah, my 2 friends Khai and Ridwana and myself have been pre-educated and pre-empted by Hj Yahya and Hjh Kamisah exclusively that hajj is definitely different from umrah. Situations may subject to change and it really happened. For eg. The long wait at the jeddah customs and hajj terminal, long wait for transport to arafah, not being able to mabit at Muzdalifah due to road block, road block again after the subuh prayer and tawaf haji that have caused a long wait in the bus before departing back to shisha and a long walk to the hotel after the ziarah around Mekah due to road block once again. I acknowledged that all these events were certainly not within Shahidah's control. The head's up by Hj Yahya and Hjh Kamisah to the unexpected circumstances have actually prepared me mentally before hand and therefore, I've moderated my expectations. In fact I took all the unforeseen and unexpected circumstances as a test which led to building my patience and iman, insyaa allah. Overall, the whole trip was an experiential learning journey for me and I believe the same goes to the rest of the jemaahs too and those challenges were the key events that have made the hajj journey memorable. Well done to Shahidah and it's team. Wassalam. Salam. Our stay at Shisha was really awesome. We made new friends. Alhamdulillah with great roommates we enjoyed our stay there. My mind had been set that hajj is different from umrah.. and alhamdulillah I managed to adjust myself and could accept any circumstances that surfaced. The above is just a feedback that Shahidah can look into to serve better in future for jemaahs of various age group and health conditions. Thumbs up to all Shahidah officers. I am satisfied with their service and acknowledged their hardwork, especially to couple Hj Yahya Said n Hjh Kamisah Salleh for their guidance, kind concern, patience and the extra mile that they have gone to ensure jemaahs needs and wants are met and feel comfortable. Alhamdulillah, pegawai Mustaqimah is the best! Thank you, Mus for all the help. We cannot expect 100% perfection but what ever is it, Alhamdulillah! Thank you Allah, thank u Shahidah Travel. 1) We managed to perform various solat sunnat at Shisha which we rarely do and gained many religious knowledge and tips from Ustaz Salam and Ustaz Baharrudin. 2) The local Singapore food at Shisha was awesome especially the Asam Pedas. Yummy! Credit goes to our chef, Mak Ani! 3) The overnight stay with other jemaah at Arafah was indeed memorable. It was like camping during school days but except that the tent at Arafah was airconditioned!